Tara is a completely enlightened buddha who had previously promised to appear, after enlightenment, in the form of a female bodhisattva and goddess for the benefit of all beings. Her primary activity is to protect from the eight fears. Practiced in all Schools of Tibetan Buddhism her various forms are found in all classes of tantra. Tara or Drol-ma in Tibetan, mean goddess of protection and compassion. Tara is the bodhisattva representing the miraculous activities of all buddhas. 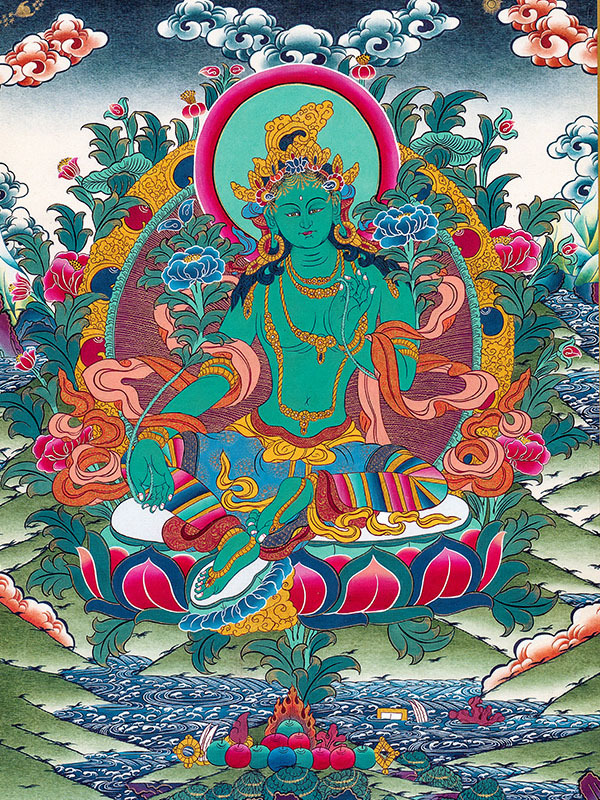 There are innumerable manifestations of Tara, manifesting in so many ways as sentient beings may require, but her most famous are the peaceful WHITE TARA, who brings protection, long life and peace; and the dynamic GREEN TARA, who overcomes obstacles and saves beings in dangerous situations in the most immediate manner. Tara is also well know in 19 other forms that together make up the total of 21 that are highlighted in each of the twenty-one verses of praise to Tara recited in the practice.